At nearly 130 years old, Coronado Island’s luxury property The Hotel del Coronado is a must-see landmark if you enjoy traveling. It’s one of America’s most famous hotels, featured in movies throughout the decades. It’s also somewhere I’ve always wanted to stay. But I’d never been to Coronado Island, located off the coast of San Diego—until this past June. When my family decided to visit San Diego, I made sure to book time at the legendary Hotel del Coronado, or The Del for short. My husband, our 4-year-old son Harry, and I spent three days in San Diego, and to end our trip, made an exciting trek over the long bridge to Coronado Island. The island itself is quaint with sweeping views of San Diego. Shops, restaurants, and homes line the streets, giving way to the gorgeous white Hotel del Coronado resort with its rich, red roof. The resort looks every bit as good in person as it does in photos. Experience the poolside cabanas. This was the first thing we did when we arrived at The Del. We arrived early, and our room wasn’t ready yet, so we headed to the pool. 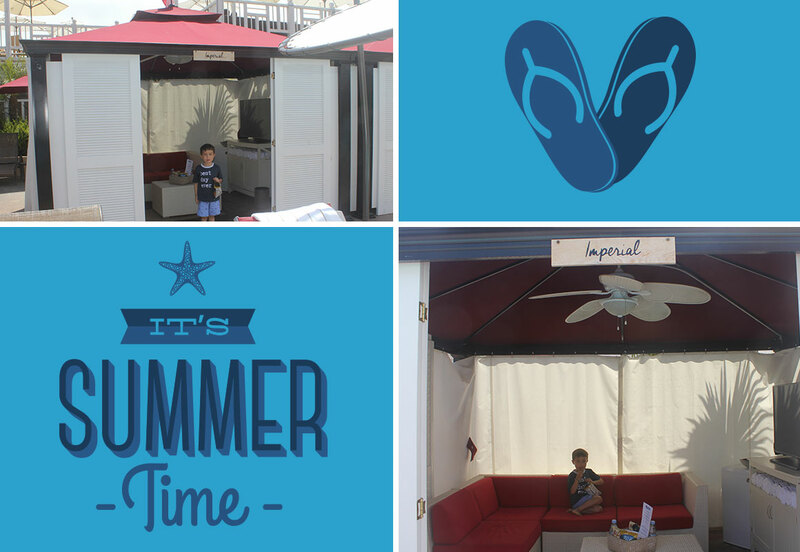 We were invited to experience one of the cabanas for the day, and in a word, it was: awesome. The cabana was high-tech with a flatscreen TV, a fridge packed with snacks, and comfy couches. The day was a bit breezy, so it was nice to rotate between playing in the pool and our cabana—our own private, inside-outside retreat. Educate yourself. I was very curious about The Del’s history. So while Harry and my husband dove into the pool, I found a channel on our cabana TV about the history of the hotel. The channel told stories of celebrities who had stayed there, including past presidents, Marilyn Monroe, and L. Frank Baum, author of The Wonderful Wizard of OZ, who used to hold story times for kids staying at the resort in the early 1900s. Ride the historic elevator. The Del has an original elevator that goes from pool level up to the rooms. The man who operates it and the wrought iron gates he pulls shut before the elevator ascends make it an especially fun adventure for kids. Harry didn’t know what to think as he stepped back in time. Browse the hotel shops. As we were walking to our room, we passed loads of hotel shops, full of souvenirs and historic, high-end house wares that would make perfect gifts for family and friends back home. There was also a candy shop, toy store, and clothing and jewelry boutiques all on the way from the pool to the elevator. Settle in, and spend time on your balcony. Honestly, I wasn’t sure what to expect of our room. The hotel was built in 1888, and our junior suite with an ocean view was located in the original Victorian era building. It did not disappoint. Our views of the beach were gorgeous, the furniture was brand new, and the technology was completely updated. I was also surprised at how large the suite was for such an older hotel. Our balcony overlooked the ocean, and was really the focal point of the room. Head down to the beach. After settling into our room, the next to-do on our list was the beach. My husband doesn’t love sand, but the sand on the beach at The Del was different—all soft, white sand. All around, people were playing guitar and hanging out. Kids were running and playing. The hotel staff had set up cabana-style chairs and offered beach-side service. Harry, of course, wanted to build sand castles, and we were especially impressed with the professional sand castle builder on site. He had built an elaborate castle, and everyone on the beach rotated taking photos with it. Book a session at the award-winning spa. Unfortunately, I didn’t have time to schedule an appointment on this trip, but it gives me a reason to return. I’m all about giving husbands time with the kids, while you have a restorative moment to yourself. Sign up for Kidtopia classes. The Kids’ Camp at The Del offers tons of morning and afternoon classes, and each day features a different theme. The day we walked in, they had a recycling theme, and were using old items to create new artwork. Harry loves arts and crafts, so he was excited to try it out. That gave my husband and I time to enjoy a long, leisurely breakfast—not one of Harry’s favorite ways to spend a morning. Harry ended up being the only kid in the class, but the counselors made it fun for him. He had so much fun, in fact, that he didn’t want to leave, and had we stayed at the resort longer, we would’ve loved to sign him up for some of the afternoon and evening programs. Enjoy the island. Have dinner at one of the many restaurants in town. If your kids are old enough, rent bikes, and bike the entire island. At night, roast s’mores on the beach, and sit in on movies at the pool. There are so many activities available that would make for great family events. A trip to The Del truly feels like you’ve stepped back in time. Strolling through the beautifully landscaped atrium or down the beach lets you imagine how it would have felt back in the 1800s. My advice for booking: Look online for specials, which the hotel offers throughout the year. Depending on who you’re traveling with, check out accommodations in the main building if your family is smaller; consider the bigger villas for fun, multi-generational trips. Consider inviting the whole family for a getaway! Grandparents especially would love The Del because they very likely grew up seeing movies filmed there. As you walk through the halls together, you’ll see photos lining the walls of famous Hollywood stars vacationing and kids at the turn of the century playing at the beach, and you’ll feel that great historic vacation destination energy. We were guests of Hotel del Coronado for purposes of this review. I give my honest opinions no matter who is picking up the check. I LOVE the sound of this hotel! 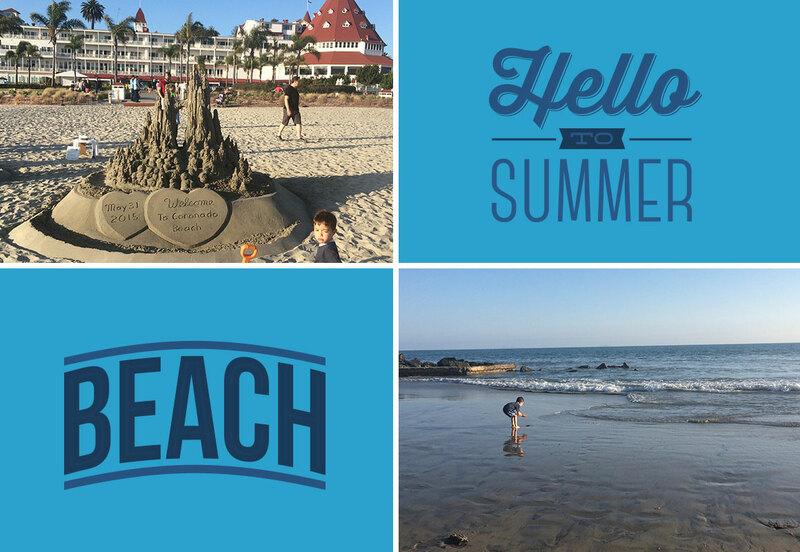 I had never heard of the Del Coronado before (nor have I ever been to San Diego) but it is now on my list. I really love hotels with a story and a sense of history and this sounds like it’s got both – as well as plenty to keep the kid’s occupied. Sold! We love Coronado and visit regularly since we live only an hour away. I haven’t stayed at Hotel Del Coronado yet but I hear only good things. I’m going to put it on my list. Stunning photos! Oh, how I love the Hotel Del Coronado! I lived in San Diego for years and often brought visiting friends and family to the Del for a day at the beach or meal. My family was lucky enough to do a staycation there one year and I’m so glad we did. Maybe we need to do a repeat?! Kids Club? Hm…. My daughter LOVES Kids Clubs and we do too, since it gives us some time to chill 🙂 Looks like we should keep Del Colonado in mind for a possible trip to San Diego. Thank you for all the tips and photos! Wow! What a gorgeous hotel property. Love the history and stunning design of the The Del. Putting it on my list for a future visit.